The Cariboo Gold Rush: Grub High, Whiskey Bad, Money Plenty! Gold rushes in Canada have all the exciting elements of one of the old pulp action-adventure novel. Greed, bloodlust, native Americans, Chinese prospectors! For example, let’s look at the Cariboo Gold Rush. When I say “Cariboo Gold Rush,” you may say “What?” Most people have forgotten what was the most exciting event of its day. The Cariboo was sandwiched between the California Gold Rush of 49 and the Klondike Gold Rush of 89. The Native Americans knew about the gold long before the White Man, of course. Heck, it was scattered around for the taking, and when it was buried, they could dig it out with iron spoons. But then some white men found gold on a sandbank in the Fraser River in the 1850s, and the race for gold in British Columbia began in earnest. San Francisco, in that day, along with being a den of villainy, drunkenness and riff-raff, was filled with idle miners who had either blown their fortunes from the ‘49 gold rush or never found one. At news of the yellow metal, 25,000 men set out from San Francisco for the wilds of British Columbia. Even before they got there, trouble broke out. The story goes that Indians came into a gold camp under a flag of truce and then slaughtered the unsuspecting miners while their backs were turned. Modern-day historians doubt it was that cut-and-dried. But true or not, one thing the story provided was an excuse to kill the Native Americans who lived on ground the miners wanted to mine. Greed, blood and gold have intertwined throughout history; British Columbia would prove to be no different. On the miners came. More gold was found at a place called Cariboo — even richer than the first strike at Fraser. The gold rush started paying off big-time in the summer of 1861.One company estimated that they had made a profit of $80,000 by early August — this was when gold fetched $18.93 per ounce. A day’s worth of work was not measured in ounces of gold — it was measured in POUNDS of gold. Some prospecting teams produced up to 30 pounds of gold a day. 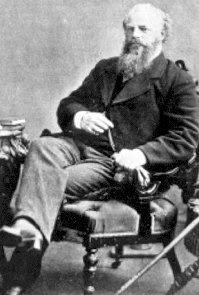 By the end of the 1861 mining season, $2,600,000 worth of gold had been produced, most of it from the Cariboo region. The output for the next year, 1862, was slightly more. Thousands of men lined the rivers, panning for gold, and digging up every hopeful inch with wild abandon. I am well, and so are the rest of the boys. I avail myself of the present opportunity to write you a half dozen lines to let you know I am well, and doing well — making from two to three thousand dollars a day! Times good — grub high — whiskey bad — money plenty. Such letters spread the word about the gold diggings and the money to be made. And sure, fortunes were made … and usually lost. Sometimes they were lost with real style. Big winners who became losers include Billy Barker, Michael Costin Brown and John “Cariboo” Cameron. Barker pulled $1,000 worth of gold out of one small crevice he found 80 feet down in a hole that other miners ridiculed. That shut up the doubters right quick. Cariboo Cameron gets my vote for the most amazing mix of good and bad luck. He had already made a good strike in the California gold rush with his two brothers. They then heard about the strike on the Fraser River, went north and hit it big again, returning with $20,000 between them, a sizeable sum. Meanwhile, Cameron bought $2,000 worth of candles and sold them for $10,000 in the mine fields. That was a surer profit than he could have probably made with gold itself, and a reminder that you can do just as well in pick-and-shovel makers than gold miners. A bitterly cold winter set in. Sophia had another baby, who arrived in the world stillborn. Then Sophia died as well. Cameron became obsessed with the mine, working at it night and day. And sure enough, he struck paydirt. Cameron was rich, but he was also heartbroken. He wanted to take his wife home for burial, so he hired miners to work three shifts, 24/7 to get the gold out soon as possible. Then he took Sophia home, pickled, in a tin coffin. The story doesn’t end there. Cameron invested his money in everything from steamships to timber, and lost it all. He married a new wife, came back to the gold fields, and met with no success at all. He died flat-broke. But surprising their detractors, Chinese miners were both more disciplined and persistent. They invented the panning machines used to separate gold from mud. And they had some big strikes, even in the abandoned mines. It turns out that the good ol’ boys just weren’t looking hard enough. Chinatown in Barkerville was a huddle of small shacks warmed by wood stoves. There was also a laundry and at least one gambling den. The Chinese men — and a few women and children — were used to farming, so they raised pigs and chickens and grew vegetables in their backyards. Along with mining, the Chinese also worked as doctors, herbalists, storekeepers, innkeepers, cooks and restaurant owners. By the end of 1863, more than 100 companies had staked a total of 3,000 claims, and the value of the gold removed that year was just under $4,000,000. The years 1864 and 1865 saw similar gold production levels. 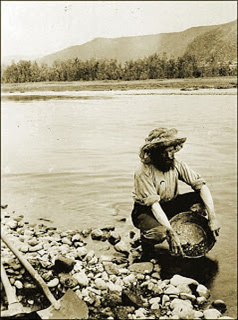 Most of the gold was found during the first five years of the Cariboo gold rush. Still, many claims were worked until 1900. It is estimated that William’s Creek and two of its tributaries, Conklin and Stout’s Gulch, produced $30,000,000 worth of gold between 1861 and 1898. Gold Rushes always end in a bust. In 1868, the town of Barkerville burned to the ground in what became known as the Barkerville fire. Though reconstruction began the next day, the Gold Rush was already dwindling. The Cariboo petered out, but the death knell came in an act that had its seeds in 1867; when Russia sold Alaska to the U.S. In 1896, settlers in Alaska found that you could dig up amazing quantities of gold right on the beach. Those miners that were left in the Cariboo picked up stakes and headed for Alaska. Canada hosted other gold rushes — and an amazing silver rush that I’ll have to tell you about as well. But that story, as well as the story of the Klondike Gold Rush, will wait for another time. Lesson #2. Discipline often separates winners from losers. A disciplined, scientific approach to investing, carefully removing the wheat from the chaff, is equally important. Lesson #3. There’s plenty of ways to make money in a resource boom. You don’t always have to invest in the companies that extract the gold, the oil or other natural resources from the ground. You can do equally well with those that service the industry. Lesson #4. Booms are often followed by busts. British Columbia sank into an economic depression once the gold ran out. So, in many ways, the Cariboo was like gold rushes in the United States, only a little northier. Even today, some of the best gold mines — and the best prospects — are north of the border. We’ll be sure to explore some of them in my monthly newsletter, Wealth Supercycle. good lesson.. I bought SMG for the same reason. I wish i could find a good company that makes hydroponic equipment for the same reason. Any suggestions.